Do you know what happens when you have a little one who can’t nap without someone laying next to them? Pinterest happens, my friends. Me and my iPhone, for two hours a day, every single day this week. Since our family plans to move to a different town and a bigger house soon, I have been scouring the corners of Pinterest for inspiration in my dream home. 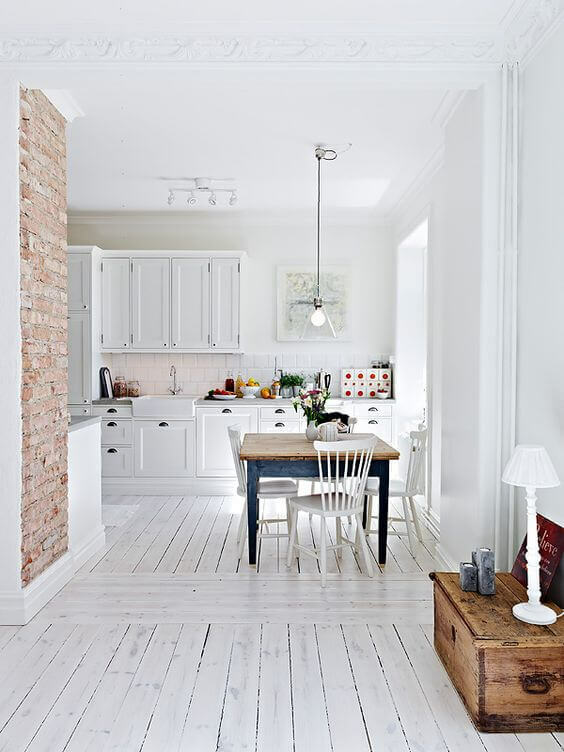 I’m a sucker for old homes and farmhouses, but I just love a clean, white interior. The fact that most of my inspirational pins fell under the “modern minimalist decor” scheme was very surprising to me. Take it from someone who once painted their kitchen lime green (and loved it! ), change is possible! Slowly but surely, our current home has morphed from a mismatched, vibrant color scheme to a white-ish one, and I think I’m ready to go all modern minimalist decor crazy in our next home with winter whites. Everything about this dining room is modern minimalist decor love. Wood floors, plenty of natural light, a sturdy wooden farmhouse table–and I really do think I’m falling in love with that style of chair. Sigh…. One thing I would love to have in our next home is an entryway. I would love to have that exact bench in mine, and that sign by Visual Pixie is just adorable. 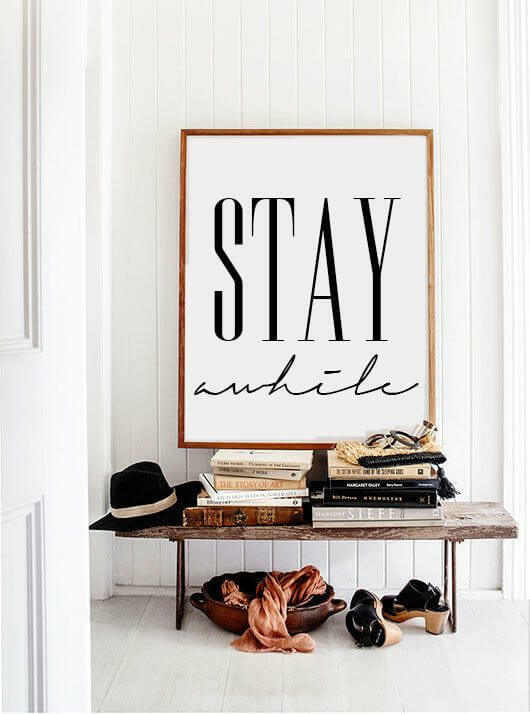 What a beautiful way to invite guests into your home! Well as far as kitchens go, I really think it would be difficult to top this one! Exposed brick, whitewashed floors, white cabinets and a farmhouse sink–this kitchen literally crawled right out of my dreams. Modern minimalist decor with a strong Scandinavian presence-I am drooling now! And of course, every kitchen should have a breakfast nook, should it not? Those chairs are just about the most awesome thing I have ever seen–somebody tell me where to find them! Again, I’m loving the clean minimalist aesthetic with the chairs being the perfect pop of texture against all the white! I guess my love for all these Scandinavian-inspired interiors shouldn’t come as a surprise–given my undying love for IKEA. Nevertheless, this is white done right, in my book. Texture+plants+white=my idea of perfection. 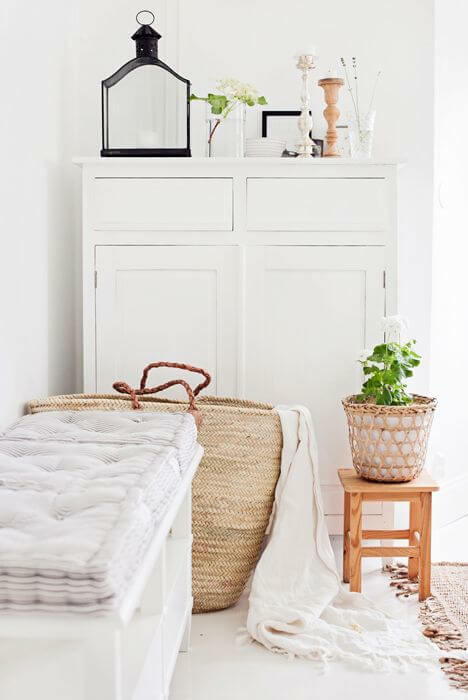 This would make for a cozy corner in an entryway or a living room, don’t you think? 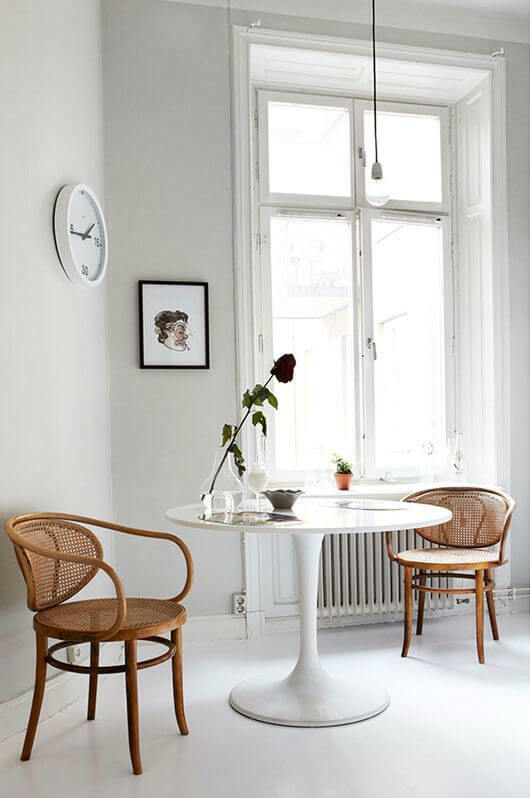 So there you have it, all the modern minimalist decor that has had me swooning this week. Whaddayouthink? Should we meet again like this, next Friday? Anybody else digging this style? !